TRENTON — The chief counsel to Gov. Philip D. Murphy of New Jersey came under withering questioning on Friday from lawmakers who pointedly challenged whether the administration took seriously an accusation of sexual assault against a top Murphy official. “You thought it was important but you let him stay there for all those months,” asked Assemblywoman Holly T. Schepisi, a Republican, referring to why the state continued to employ the accused, Albert J. Alvarez. “With all due respect, do you believe it was better for him to remain employed? Was it intentional to leave him employed or was it just lack of experience?” she said. Mr. Platkin, who has emerged as a central character in the administration’s handling of the accusation, also said during testimony that while he asked Mr. Alvarez to leave, he never directly tried to force him out, including imposing a deadline. The accusation by Katie Brennan, also a top Murphy official, against Mr. Alvarez has roiled the administration and hurt the progressive image of Mr. Murphy, a Democrat. In December, at the start of the legislative hearings before a special committee into the handling of the allegation, Ms. Brennan gave wrenching testimony about her accusation that Mr. Alvarez raped her after a campaign event in 2017, and described how the state continued to allow Mr. Alvarez to work despite her repeated pleas. Calls to the governor’s press secretary were not immediately returned. The chief counsel testified that he was with Mr. Murphy when the governor first learned about the allegation. “I can tell you that the governor was visibly shocked and upset, and did not appear to have any prior knowledge of the accusation,” he said. Mr. Platkin said the governor did not learn about the sexual assault accusation until October, about seven months after the chief counsel first heard of it and after Ms. Brennan took her story to The Wall Street Journal. Only afterward did Mr. Alvarez resign. Mr. Platkin hewed repeatedly on Friday to his explanation that he did not tell the governor earlier because he did not want to violate any rules of confidentiality in the state’s Equal Employment Opportunity policy. “You do not deem it appropriate for the governor to be aware?” Loretta Weinberg, the State Senate majority leader, asked. “I think given the facts we know now I would have informed the governor more promptly,” he said. Ms. Weinberg, a Democrat, pushed him on whether he gave Mr. Alvarez a hard deadline as to when he needed to leave his job. “Did you at any point give him a final date at which point he would have to leave state employment?” she asked. “That I did not,” Mr. Platkin replied. He added that he did not know who had originally hired Mr. Alvarez. In an opening statement, Mr. Platkin described a phone call on June 2 in which Mr. Alvarez, who had a new job for the administration as chief of staff to the Schools Development Authority, called him “sobbing” and “vehemently” denying the allegation against him. Mr. Alvarez also told Platkin that he had two children to care for and that he had been investigated but not charged by the Hudson County Prosecutor’s Office. Mr. Platkin and Ms. Brennan had been friends before the campaign, and Ms. Brennan said Mr. Platkin was “horrified” and “disgusted” when she told him her story. He testified that upon talking to her, he asked Heather Taylor, the administration’s chief ethics officer, to report the allegation to the state attorney general. Mr. Platkin also recused himself from the rest of the investigation, since he knew Ms. Brennan and Mr. Alvarez personally. Eventually, Mr. Platkin said, Ms. Taylor informed him that the state could not investigate the allegation because, based on Ms. Brennan’s telling, it happened off state property when neither person was a state employee. Mr. Platkin remained deeply involved with the administration’s sluggish response to Ms. Brennan’s allegation, according to testimony from Pete Cammarano, Mr. Murphy’s chief of staff, and Charlie McKenna, a former administration official and Mr. Alvarez’s former boss. It was Mr. Platkin who advised Mr. Cammarano not to tell the governor about the allegation, citing confidentiality policy. In June, Ms. Brennan reached out directly to Mr. Murphy in an email, saying she wanted to discuss a “sensitive matter” with the governor and his wife. Mr. Murphy responded by saying they were “on it” and forwarded Ms. Brennan’s message to Mr. Platkin and Jonathan Berkon, the lawyer for his campaign. Mr. Platkin then informed Mr. Berkon of the details of the allegation, and instructed him to reply. Mr. Platkin then reached out to Mr. McKenna and instructed him to tell Mr. Alvarez to “step back” from state government and find another job, though he did not provide full details of the allegation. Mr. McKenna said Mr. Platkin told him that “something happened during the campaign” and that if it “came to the fore, it would not be a good situation and could embarrass the governor.” Mr. Platkin testified that neither he nor anyone he knew tried to help Mr. Alvarez find other work. Mr. Platkin was one of the earliest hires in the governor’s orbit, joining an organization in 2015 that helped Mr. Murphy plant the roots of his campaign. Mr. Platkin joined the official campaign when it began in 2016, and he quickly rose through the ranks to policy director. 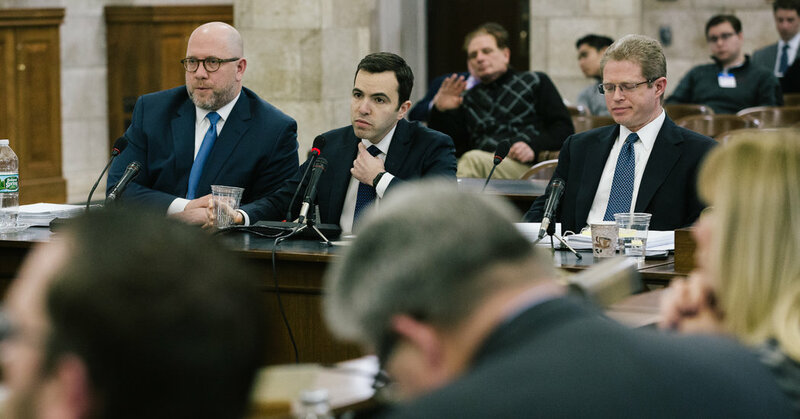 Though the governor has not made many comments about the testimony of his top aides, he did perhaps offer a sign of support: At his State of the State address this week, walking directly in front of Mr. Murphy as he entered the assembly chambers were Mr. Platkin and Mr. Cammarano.